Dark circles are dark blemishes seen around the eyes. They are known as periorbital dark circles in medical terms. This is a common problem seen in men and women. Dark circles are also occasionally found in children. When people get aged their skin becomes thinner. The elasticity of the skin is lost due to the loss of collagen. This makes the area appear darker as the blood vessels beneath the eyes become more visible. Many people consider that dark circle appears when a person is tired; this is not true there are many causes for the development of dark circles under the eye. Cucumber is a very good astringent and has got skin lightening properties also. For quick treatment of dark circles you can always rely on cucumber. Get a fresh cucumber and cut it into thick slices and keep them in the refrigerator for half an hour. Now put the cucumber slices onto the affected skin area for about ten minutes. Finally wash the area with plain water. This remedy will have a soothing and refreshing affect on the skin. Another way to treat dark circles is to mix cucumber juice with lemon juice in equal quantities, then apply it with the help of a cotton ball over the affected skin. Leave for fifteen minutes and then wash it off with water. Follow this remedy for a week and soon the puffiness of the eyes and dark circles will vanish. There are natural bleaching agents present in potato that can help lighten the dark circles and get rid of puffiness around the eyes. Take one or two chilled potatoes and grate them to extract its juice. Now soak a cotton ball in the potato juice and place it on to your closed eyes. Make sure the juice covers the dark circles under your eyes as well as the eyelids. Allow the juice to sit for ten to fifteen minutes and finally rinse your eyelids properly with cool water and apply a cream. Instead of potato juice you can also use thick potato slice to remove dark circles. Tomato has also got certain properties that can lighten skin color to a great extent. Take a teaspoon of tomato juice and mix it with one teaspoon of lemon juice. Apply this mixture on the dark circles in a very gentle manner and allow it to sit for ten minutes. Finally rinse it off gently with clean water. Follow this remedy twice a day to reduce the dark circles. Even drinking a glass of tomato juice with some mint leaves, lemon juice and salt can help a lot in getting rid of dark circles. But be sure to drink this solution immediately after making it for maximum result. To get quick rid of dark circles you can take advantage of the incredible skin care properties present in rose water. Take cotton eye pads and soak them in rose water for a few minutes. Put these soaked eye pads on your closed eye lids for about fifteen minutes. Rose water will have a soothing effect on the eyes and it will also rejuvenate the skin around the eyes. This particular remedy can completely remove the dark circles if followed regularly twice daily for a few weeks. Almond oil is another natural ingredient which is very beneficial for the delicate skin around your eyes. Regular usage of almond oil will lighten the skin color around the eyes. Take a little almond oil and apply it over the dark circles before going to bed and gently massage it. Leave it overnight and wash it off with cold water the next morning. Follow this remedy daily until the dark circles under the eyes disappear almost entirely. Apart from almond oil you can also use Vitamin E oil to eliminate dark patches of skin under the eyes. The bleaching properties of vitamin C present in lemon juice can also help to remove dark circles under the eyes. You can apply fresh lemon juice with the help of cotton ball around your eyes and rinse it off after ten minutes. Another option is to make a thick paste by adding one tablespoon of lemon juice to two tablespoon of tomato puree, a pinch of gram flour and turmeric powder. Apply this thick paste gently around your eyes. Rinse it off with clean water after ten to fifteen minutes. Repeat this process twice or thrice every week and soon the skin tone around your eyes will become lighter and eventually the dark circles will go away. Cold water can constrict the blood vessels under the eyes and help a lot to reduce eye puffiness and dark circles. Take a washcloth soaked in cold water or cold milk and put it directly over your closed eye lids for several minutes. Alternatively, you can also wrap a few ice cubes in a soft napkin and place it under your eyes. Instead of an ice pack, you can also use a bag of frozen peas, a chilled teabag and a cold spoon. Repeat the process three to four times daily for a few weeks. Apple can also be used to remove dark circles in a natural way. The tannic acid present in apple can lighten the skin tone. At the same time water soluble vitamins B and C, as well as potassium present in apple give the much needed nourishment to the delicate skin around the eyes. Take one ripe apple and cut it into thick pieces. Put the apple slices under your eyes and leave it for about half an hour. Finally you can wash the skin area with cold water and apply some cream. Another option is to make a paste of boiled green apple and then apply it under your eyes and after half an hour rinse with lukewarm water. Mint leaves can give cooling effect and remove dark circles in a very natural manner. Take few fresh mint leaves and crush them gently. Now apply the crushed mint leaves around your eyes and leave it for five to ten minutes. Then gently wipe it off with a clean and cold cloth. 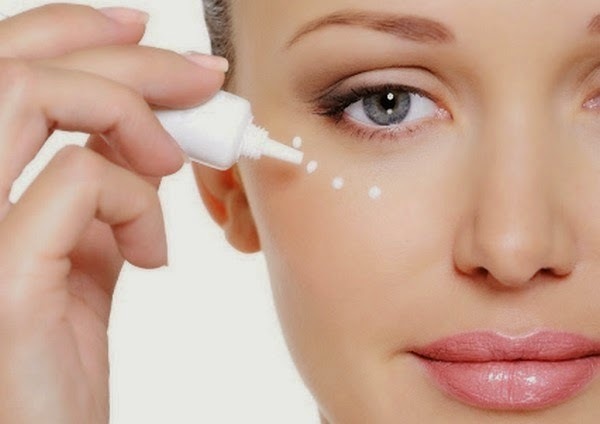 It is one of the effective home remedies for under eye dark circles. Another option is to add mint leaves paste to tomato juice and then apply this paste on the dark circles. Allow it to sit for a few minutes and then rinse the area properly with cold water. Turmeric has antioxidant and anti-inflammatory properties and hence it can be used to remove dark circles. Take turmeric powder and mix it with pineapple juice to make a thick paste. Apply this paste to the affected area and allow it to stay for about ten minutes before wiping it away with a soft damp cloth. Besides removing the dark circles it will also make the skin around your eyes smoother and softer than before. This remedy should be followed daily until you get positive results.